Knowledge tests $29.95 for three attempts for the same customer. Available in 7 languages. WE OFFER LESSONS AND TESTS OUTSIDE OF THE HOURS POSTED BELOW. PLEASE CALL FOR AVAILABILITY. *One of our instructors will be going over what to expect from the course! *No need to register, just show up on the day that works best for you. Drivers’ Education taught by Police Officers! 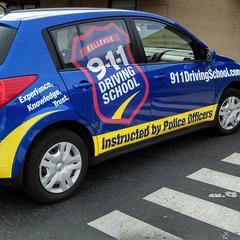 911 Driving School of Redmond is owned and operated by police officers who have over 35+ years of experience in law enforcement. We teach today’s teens and adults how to become tomorrow’s safest drivers, making the roadways a safer place for everyone. ONLY a law enforcement instructor here at 911 can provide such a vast amount of knowledge, trust, experience and hundreds of real-life stories, making this the finest Drivers’ Ed program in the nation! *Please arrive 15 minutes before the scheduled start time to get checked in. No car to take your test? No problem! Use ours for an additional fee. 1 Official WA State Knowledge Test for obtaining a license. Good for three attempts. 1 Official WA State Road Test for obtaining a license. Includes the option to use a school vehicle at no additional charge. 1 Official WA State Road Test for obtaining a license with 40 Minute Warm Up immediately prior to the test. The warm up must be conducted in a school vehicle. Pre-register for your WA state knowledge test and walk-in for any posted test time on the schedule above. You can find the schedule just above the blue tabs on this webpage. We test on a walk in basis Tuesday through Thursday between 10am and 5pm. You do not need an individual appointment to test at those times. The price is good for three attempts for the same person. Only three attempts allowed per day. Please bring your photo ID and DOL confirmation number with you. Please sign up here first to make the check in process more efficient when you arrive. For a list of all testing policies, please click the dark blue "policies" tab above and to the right. We have Nissan Versas and Ford Taurus. You do not need your own insurance to use our cars. The WA State knowledge test must be passed before a Road Test can be provided. We can provide you with a temporary permit to take the test if you do not have a WA permit or license from another country. Sign up here for your WA State Knowledge test, then walk in for your test. We test on a walk in basis Tuesday through Thursday between 10am and 5pm. You do not need an individual appointment to test at those times. The price is good for three attempts for the same person. Only three attempts allowed per day. Please bring your photo ID and DOL confirmation number with you. 1 WA State Road Test in a 911 Vehicle. You must have a license from another country to use your own vehicle for warm up. Those with WA permits must use a 911 car per DOL guidelines. The warm up is intended for those who already know how to drive and are familiar with the rules of the road, but just want some time to relax and get comfortable. Testers will answer questions and practice any skills the customer wishes to work on during the warm up period. The same person who does the warm up will also administer the test itself. We schedule one hour total. To use your vehicle we will need proof of insurance, current tabs, and a pre-test check to make sure systems are in proper working order. The WA State knowledge test must be passed before a Road Test can be provided. We cannot provide a temporary permit for warm ups. We have Nissan Versas and Ford Taurus. You do not need your own insurance to use our cars. You must have a license from another country or a WA permit to do the warm up. The warm up is intended for those who already know how to drive and are familiar with the rules of the road, but just want some time to relax and get comfortable. Testers will answer questions and practice any skills the customer wishes to work on during the warm up period. The same person who does the warm up will also administer the test itself. We schedule one hour total. The WA State knowledge test must be passed before a Road Test can be provided. We cannot provide a temporary permit for warm ups. You must have a WA State permit or a valid license from another state or country with you at all times to take lessons. All lessons are done in our school instruction vehicles, which are equipped with an instructor brake and mirror. All vehicles have automatic transmissions and are fully insured, so you do not need your own insurance to take lessons. All lessons are customized to the individual customer, and we can work on anything you wish. Lessons are available 7 days a week at all times of day. Pick up and drop off locations must be within a ten minute drive and 5 mile radius of our school. You must have a WA State permit or a valid license from another state or country with you at all times to take lessons. All lessons are done in our school instruction vehicles, which are equipped with an instructor brake and mirror. All vehicles have automatic transmissions and are fully insured, so you do not need your own insurance to take lessons. All lessons are customized to the individual customer, and we can work on anything you wish. Lessons are available 7 days a week at all times of day. Pick up and drop off locations must be within a ten minute drive and 5 mile radius of our school. The knowledge test must be passed before we can administer the road test. Pick up and drop off service is for the lessons only. The test must be done at the school.